NBC Bearings is the premier brand of India’s leading bearings manufacturer and exporter, National Engineering Industries Ltd (NEI). Founded in 1946, NBC is a pioneer, renowned for excellence in quality and delivery for over 60 years. An integral part of the US$ 1.6Bn CK Birla Group, NBC produces over 100 million bearings each year in more than 1000 sizes to serve a host of varied customers across India and 21 other countries in 5 continents. A flexibility of approach and action, a commitment to customer satisfaction and innovation, design and product development has ensured that NBC is not just the fastest growing bearings company in India. It is increasingly, a preferred and collaborative technological partner for new product development for specialized bearings and allied engineering products. 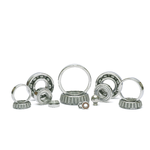 NBC produces over 100 million bearings each year in more than 1000 sizes . Customers - OEMs / Tier 1's like Truck / Bus and other vehicle and component manufacturer who are looking for sourcing bearings from India's Biggest and most reliable manufacturer.